Syracuse University men's basketball coach Jim Boeheim made his first public appearance three days after the SUV he was driving struck and killed a pedestrian on Saturday, Feb. 23. 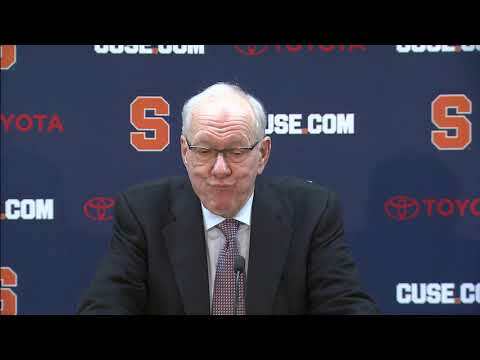 Boeheim was back on the bench coaching the Orange in a 75-65 nationally televised loss to No. 1-ranked Duke at the Carrier Dome in Syracuse. Boeheim received supportive applause from the record crowd of 35,642 as he made his way out of the tunnel and onto the court before tipoff. He was hugged at center court by Duke coach Mike Krzyzewski. After Syracuse's previous game, also at the Carrier Dome (a 69-49 win over No. 16 Louisville), Boeheim's GMC Acadia hit 51-year-old Jorge Jimenez after the Dodge Charger in which Jimenez was a passenger had crashed into the guardrail on Interstate 690. Boeheim, 74, called 911 and remained at the scene after the incident that occurred around 11:30 p.m. amid icy road conditions as he was driving home after the game, the Onondaga County DA said. Boeheim tried to avoid the vehicle in the middle of the road, the DA said. No tickets have been issued and field sobriety tests were negative. Boeheim started his post-game press conference by discussing the tragedy. "First and foremost, to the Jimenez family, I want them to know how truly devastated I am for my involvement in the loss of their loved one, Jorge Jimenez," Boeheim said. Jimenez worked several jobs, one of his four children, Brian, told ESPN . He immigrated to the U.S. from Cuba 20 years ago and loved the Yankees, cooking and fishing. Asked about his decision to coach on Saturday night, Boeheim said he "felt the responsibility and obligation to my players, the members of my basketball team." Boeheim, a former Syracuse player, has been its head coach since 1976, with a career record of 943–379 and five Final Four appearances, including winning the 2003 national championship.